On July 12-13 2015 three days of rain caused flash floods on the Mudlick Creek, a creek that runs alongside Rte 172 in Johnson County Kentucky. The creek is normally about 10 feet wide and has an 8 foot deep stream bed. 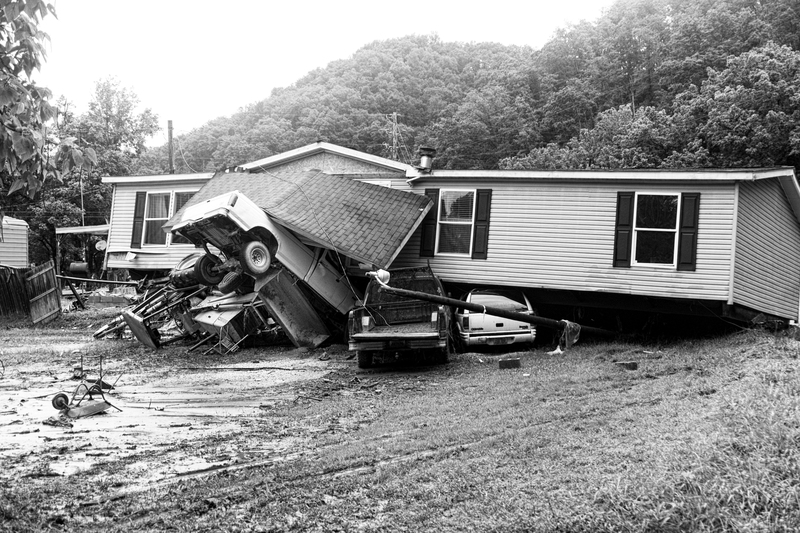 The flood hit hardest a hamlet called Flat Gap. Most of the homes alongside the creek and in the nearby hollers (not hollows) were singlewide mobile homes. The flood surge swept trailers and vehicles down river and destroyed many of them. More than 300 families lost their homes. The flood hit during the day and most families escaped. Four people were killed including one of the occupants of the trailer in the above photo. Had the flood hit during the night I’m sure the loss of life would have been much greater. Most of these photos were taken in what was a trailer park on the bank of the creek. Thanks Steve for all the photo’s. I will be looking at each one not just Kentucky. I so enjoyed being part of yours and Timms team. I enjoyed working with you also. Photography is my passion. I hope you like at least some of my photos.